If the happy couple has a great sense of humor, it probably won't hurt to have a little good-natured fun by celebrating their engagement with a humorous poem. Sometimes engagement parties can be a little stuffy, but a poem like one of the following offerings can instantly liven things up. While one of these poems may not be the perfect fit, you can certainly use any of them for inspiration. 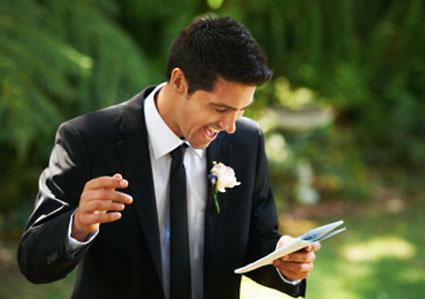 They'll put you in the right frame of mind to write a humorous poem of your own to entertain the newly-engaged couple. (Groom's name) mother and I are filled with joy. Someone's finally agreed to marry our boy. Once she becomes our son's darling wife. Like how sometimes he doesn't change his socks for days. And eating Taco Bell while holed up in the den. Be sure not to scratch his oversized toy. But he's really a good guy, and they'll do just fine. He'll make a good husband if she can keep him in line. So here's to our future daughter-in-law, who has a lot of pluck. She's marrying our son, so let's all wish her lots of luck. To be sentenced for life. And settle down in a comfortable cell. Little gangsters will join them as well. May the punishment fit the crime. As they settle down to doing time. In anticipation of their wedding day. 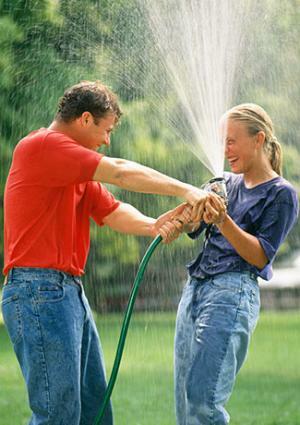 But she was smart and lured him in. So I guess you can say she wins! "My bachelor days are through. To tell me what to do." The prettiest girl he could. "Pretty please, marry me for good." To put his life in order. And for this, he adored her. And their journey of love so far. Actually began in a bar. Let me offer you both a little helpful advice. Adds a touch of spice. Or leave wet towels on the floor. Make sure you go buy more. From blurting out a tart reply. Don't let a day go by. And the years will flow smoothly past. 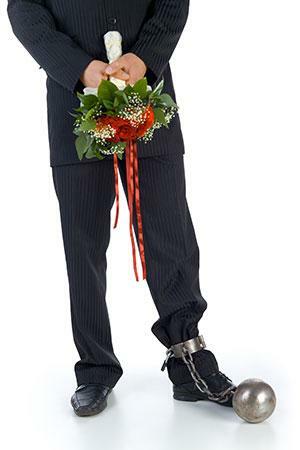 It's fun to poke the future bride and groom a little, but make absolutely sure you steer clear of insults because they will quickly dampen the mood and may even get you kicked off the wedding guest list. As long as your poem is tinged with affection, you won't have to worry about crossing over the line.